It’s not always easy being on one of the smaller teams at the downhill World Cups, but it certainly can be a lot of fun. The latest episode of the Maxxis Rubber Side Down series follows Casey Brown and her Bergamont Hayes team as they show Les Duex Alpes who’s boss. Casey Brown is a Kiwi born Canadian who is known for her stylish riding. She was crowned Queen of Crankworx in 2012 and 2014 and is a regular on the World Cup downhill circuit. In this episode we see Casey and the Bergamont crew try their hand at skiing. 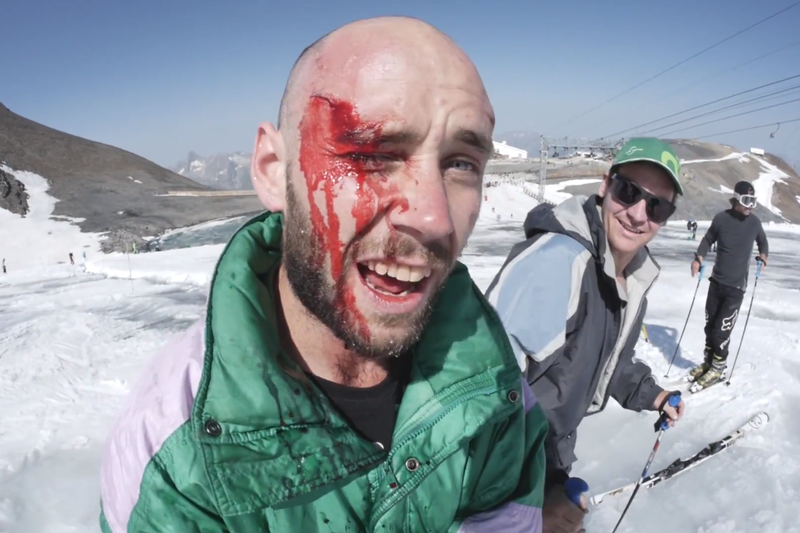 While Casey is clearly at home on the snow, Eddie Masters is less so and ends up being taken off the hill with a spilt eyebrow. Following this, Casey hits the dusty trails of Les Duex Alpes. So far she’s having a decent World Cup season and has finished just off the podium in sixth at the last two world cup rounds. On the basis of this segment she has the speed to achieve more – one to watch for the rest of the year? Rubber Side Down is a web series that follows Maxxis athletes throughout the season. In episode one we got to see Josh Bryceland’s canal boat home.